Zoya's Beach collection, new for summer features 6 new fun shades. All shades in this range have a creme finish and come with great coverage. A couple of shades look very similar to what Zoya has already done before. There aren't any dupes from the earlier collections but, some colors are close enough. Lara is a bright, vivid pink with a glossy creme finish. Two coats gives great coverage. The formula is perfect and goes on without being streaky. 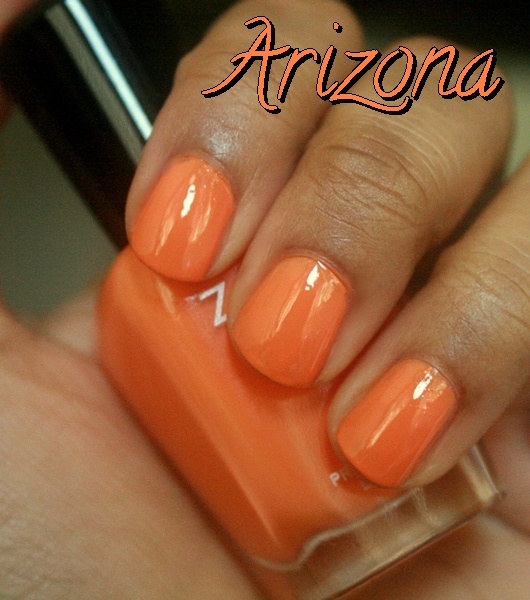 Arizona is a soft looking, wearable orange with a slight yellow undertone. The formula was a little on the thinner side but very easy to work with. The color was opaque in two coats. 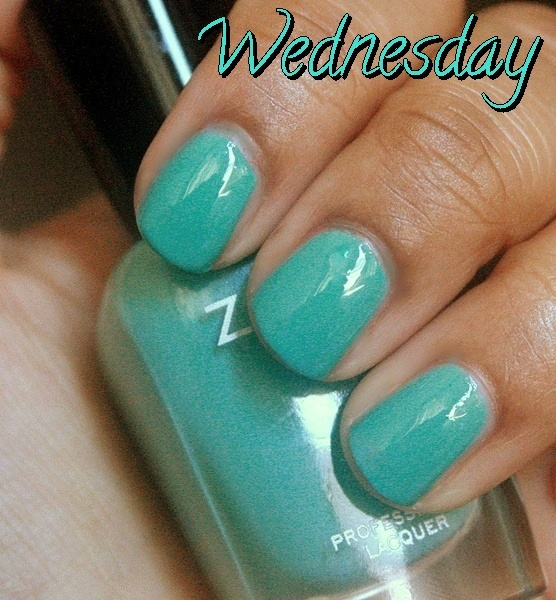 Wednesday is described perfectly by Zoya as a soft aqua cream. The formula of this one was a little thick and took longer than the others to dry. Slightly brighter and more bluish than Bevin from the Spring collection, Wednesday is a beautiful, fun color for spring and summer. 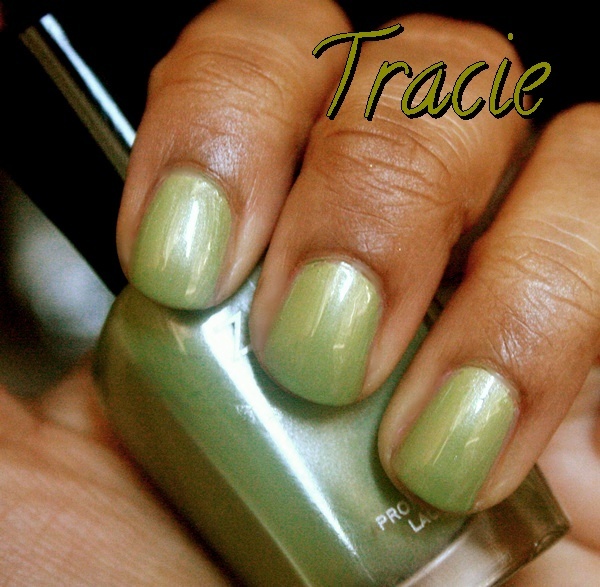 Tracie is a light green with a slight, pearly finish. The odd one of the bunch. The formula is creamy but the metallic finish leaves brush strokes. The color is undoubtedly beautiful and the soft, pearlescent sheen adds a beautiful shine. 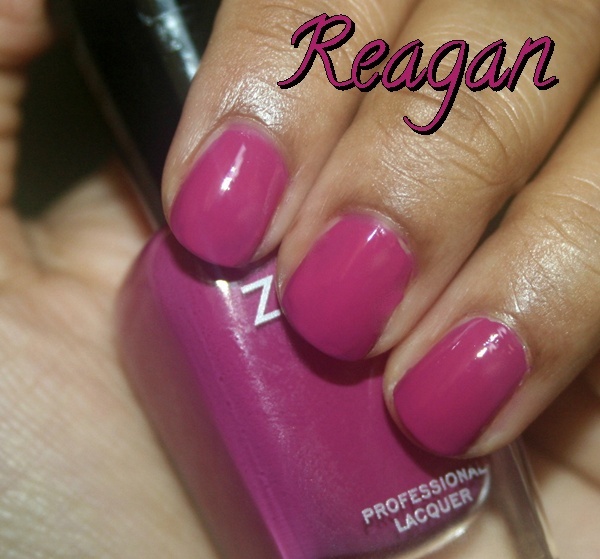 Reagan is a dark pink with a slight blue undertone. It is a great color that can be worn all through the year. It was also the most difficult shade to capture in pictures. I had to tweak the photo to bring the right shade out. The formula was a little thick and tricky to work with but had great coverage. Shebly is a bright, cool toned pink. It is not the most flattering color on my fingers. I like it better on my toes. Shelby was a little sheer and needed 3 coats for good coverage. The finish isn't very glossy so, be sure to top it off with a good topcoat. Overall, Wednesday, Arizona and Tracie are my favorites from the Beach collection. These three colors are just perfect for spring/summer and have an amazing formula that's easy to work with. It would have been really nice if a soft looking yellow was thrown into the collection instead of one of the pinks. I do love me some pinks but, Zoya already has an amazing selection of pinks to choose from. Wednesday and Arizona are great ways to wear bright colors without having to look too over the top. I'm loving the Surf collection even more so stay tuned for swatches soon! Check out photos and swatches of the Surf collection here. What are your thoughts on the Zoya Beach Collection? i keep seeing photos and swatches of these and i want them soo bad!!! Pretty, aren't they? You should get a couple of colors..so perfect for Spring and Summer!